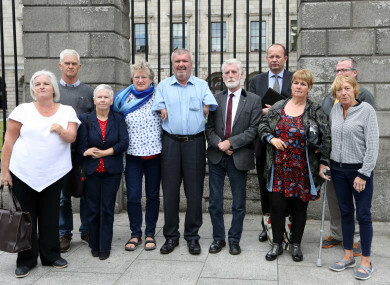 Representatives of the Irish Thalidomide Association outside court. LEGAL PROCEEDINGS INVOLVING compensation cases in relation to Thalidomide have resumed before the High Court. The court is examining if the cases, initiated in 2013, fall beyond the statute of limitations. The cases are being brought against German firm Grunenthal GmbH (the manufacturers of Thalidomide), TP Whelehan Son & Co (the Irish distributors), and the Ministers for Health and Environment. The drug, a sedative, was administered to pregnant women in the 1950s and 1960s. It is alleged to have caused deformities in unborn children. John Gordon SC, representing the plaintiffs, called on the court to not allow Grunenthal to “sit behind the statute of limitations”, saying the company has a responsibility to its Irish clients and did not respond in an adequate way to the “absolute tragedy unfolding in front of them” when the consequences of the drug became clear. Gordon noted that Thalidomide was developed in the late 1940s and early ‘50s before being put on the German market in 1955 and distributed internationally in 1957. It was first sold in Ireland in 1959. He said Grunenthal was warned about the drug’s capacity to cause severe nerve injury as far back as 1956. He said the company did not carry out clinical trials on the drug, which would have detected the problem, at the time. “This is information that the distributors presumably had access to when they were selling the drug on the Irish market,” Gordon said. He said that, following a “massive controversy”, Grunenthal stopped selling the drug in November 1961. However, it was still on the market in Ireland in June 1962. Maurice Collins SC, representing Grunenthal, said Gordon couldn’t make such a claim, adding that the date on which the pregnant woman in question took the drug had not been confirmed. Gordon said it was worth noting that Grunenthal amended its defence to plead that the claims were barred due to a settlement reached between the company and the parents of the children back in 1970. He said his clients’ parents agreed to the settlement when they “had no idea of the wrong that had in fact been perpetrated on their children by Grunenthal”. “There was a deliberate misrepresentation by Grunenthal to parents in 1970. It’s a misrepresentation which endured for many, many years,” he added. Counsel for those seeking compensation have complained that the defendants are delaying the process by making applications for discovery of documents in advance of the trial, and Gordon today noted “a significant disparity” in terms of the information and financial resources available to both sides. Collins denied that his clients sought to delay or “narrow” the remit of the cases. He said the plaintiffs must clarify what “issues operated on their minds” and led to a delay in them launching legal proceedings. “What are the factors that prevented them from bringing proceedings before they did?” he asked. Mr Justice Séamus Noonan said he would seek a statement from each plaintiff outlining what precluded or excluded them from bringing forward applications. The judge has previously expressed concerns about the slow pace of proceedings. Collins said the plaintiffs, five years on from initiating proceedings, cannot say how the cases are not barred by the statute of limitations. He said evidence of his client fraudulently concealing information in relation to the case have also not been presented. Counsel for the defendants are seeking information relating to a number of issues, including proof of how the State promoted the drug and therefore implied it was “safe for human treatment when this was not the case”. Eoin McCullough SC, for the State, noted that one of the claims says a man affected by Thalidomide has faced “prejudice in relation to job applications”. He said counsel asked for specific information in relation to this but was told they would not receive it. We’re entitled to know the nature of the case made against us. We are entitled to know the range of evidence against us, not to be taken by surprise. Gordon said specific damage claims are “ready to deliver” in 10 of the cases, while more are being finalised. He said these will be made available to the defendants. Reiterating a point he previously made, Gordon later noted: “There is in fact an extreme disparity of knowledge as between the plaintiffs and the defendants in these proceedings” – something he said should be considered when “striking balance” on who must deliver more particulars. Angus Buttenshaw SC, Counsel for TP Whelehan Son & Co, the Irish distributors of the drug, said it was essential to highlight distinctions between his client and the first-name defendants. He said the “disparity in resources” mentioned by Gordon “do not arise in relation to my client”. He said his client merely imported and distributed the drug and as such the allegation of unconscionability cannot relate to them. Buttenshaw said it was a “source of considerable frustration” that his client were spoken about as if there were in the “same position as first-name defendants”. He said the plaintiffs don’t appear to be open to engaging with his client separately. Justice Noonan said he will make his decision on the case in the next week or so. Email “Thalidomide makers didn't adequately respond to 'absolute tragedy unfolding in front of them', court hears ”. Feedback on “Thalidomide makers didn't adequately respond to 'absolute tragedy unfolding in front of them', court hears ”.